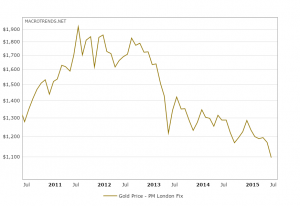 Gold Price Crash Spreads To Other Metals, And Commodities! Just a few years ago Gold was considered one of the safest investments one could make; politicians were arguing to resume backing US currency in Gold, “Cash For Gold” commercials and pawn shops sprouted up across every corner of the United States, and investors were putting more and more money into the precious metal as the value creeped upwards. Today, the price of gold has plummetted to almost half the peak, mining companies are losing money, and the overall price crash is starting to spread to copper, tin, and aluminium. So what happened? The commercial usage for gold and other metals has only increased as the economy improves, but prices continue to fall. The answer lies in the investment strategy of “hedging”, where one diversifies their investments across muliple sectors and investment types specifically so if one part of their portfolio declines in value, another part will increase. Gold is one of the most popular “hedge” assets on the market. Gold is usually seen to have “intrinsic value”, meaning people want it just because it is gold, which is one reason it used to be the backing of many major currencies. Silver is regarded in the same way. This means that when the dollar starts to “lose value”, meaning there is high inflation or it becomes more difficult to import goods, people often will move their money into Gold and Silver as a relatively “Safe” place to hold their money until economic conditions improve. This means that the demand for gold as an investment can spike when the economy as a whole is most volatile, and decline when stability improves and other investment opportunities arise. Currently, the Dollar, Bonds, and Stocks are all gaining value, and the economy as a whole has been improving, so investors previously keeping huge amounts of capital invested in gold as a “hedge” are moving their money elsewhere, reducing its “investor demand”.